When the world’s longest, fully automated, driverless railway system needed 2000 seats spread across multiple locations, it turned to a manufacturer with a proven track record – Zoeftig. Any seating solution would have to satisfy a number of very specific customer requirements. For instance, with the Dubai Metro 52km in length and the seats spread across 47 separate stations, smooth logistical management of component parts when packing and despatching was vital. It was also essential for any seating to be aesthetically appealing and architecturally pleasing, to fit in with the striking, state of the art surroundings and interiors of the metro station. All this, at the same time as meeting stringent quality criteria, and being robust enough to withstand the rigors of 23,000 passengers per direction per hour. A further important consideration was Dubai’s extreme temperatures. The very hot and arid climate, not to mention the corrosive effect of the sea air, would have an inevitable dulling effect on any traditional polished products, and chroming was not an option because of its perceived environmental impact. The Zoeftig response was typically innovative. 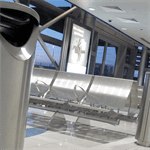 By modifying the specification of the aluminium arm and leg castings on an existing airport product, Zenky Perforated stainless steel, we created a seating solution capable of withstanding Dubai’s humid and salty environment, without the need for chroming. What’s more, we provided the perfect visual complement for the Metro’s stunning interiors by redesigning a contemporary new perforation pattern for the seat and back steels. Not only did its crisp, clean lines deliver a distinctive and attractive solution, the new pattern also improved product strength. Quality assured to ISO 9001:2008, the seating even incorporates specialist bespoke insulation components to protect seat users from earth leakage. 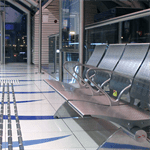 In short, Zoeftig has provided a seating solution that more than lives up to the Dubai Metro vision to supply ‘Safe and smooth transport for all’. Truly, seating setting the station standard.